As an Apple Distinguished Educator, and an Instructional Technology Coach, I recently gave a presentation at the Apple Innovation Institute in Reston, VA regarding how I teach educators and students to use iPads in the classroom. After my presentation I was asked to share my slideshow with the audience, but at the time I did not have a slideshow of resources and examples. My presentation was was simply a live demonstration performed on my iPad. Based on this request, I decided to create a slideshow that contains the apps that I use most frequently at my middle school to enhance "iPad Workflow". I first learned about the term "iPad Workflow" from my Apple Distinguished Educator colleague, Camilla Gagliolo. I really liked her model because it organized and categorized different iPad apps to help students and teachers maximize productivity and efficiency when using iPads in the classroom. The resources that I have created for this blog post simply highlight the apps that I use in my middle school, along with examples that my students and I have created within the past year. I hope that you find these apps and resources helpful if you currently use iPads at your school, or if you plan on using them in the future. 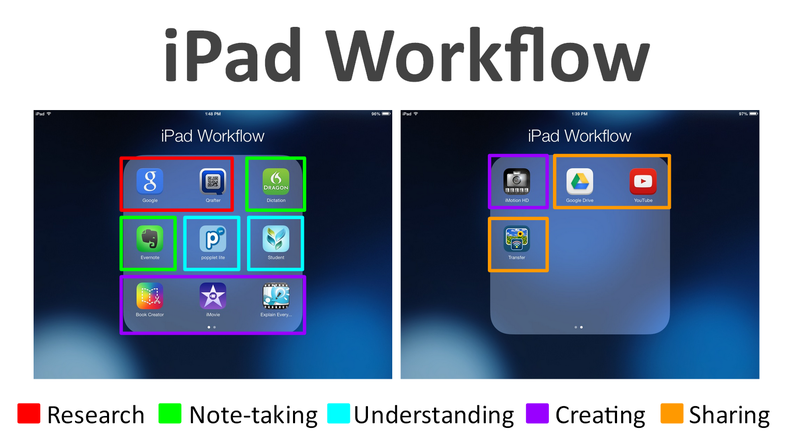 Here is a list of "iPad Workflow" apps that I use with my teachers and students.